Faculty and green roof expert Leila Tolderlund, Assistant Professor (CTT) and Associate Chair of Landscape Architecture provided green roof guidance to the Solar Decathlon 2018 winning team. The Swizz team took first place overall by designing, building, and operating the house that best blended smart energy production with innovation, market potential, and energy and water efficiency. 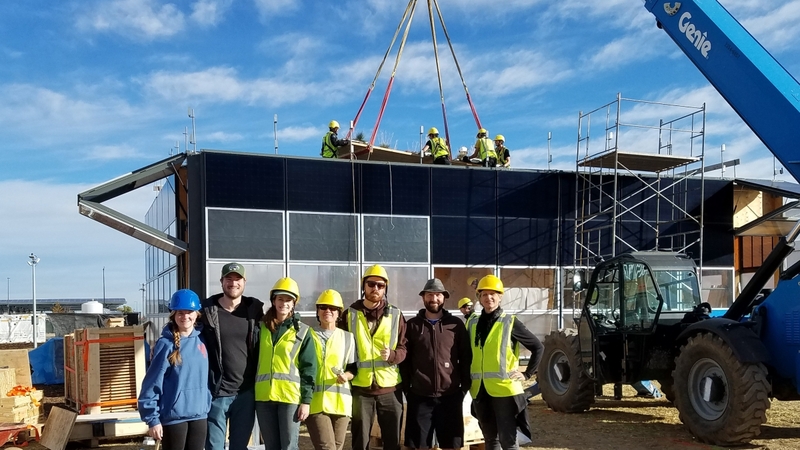 Master of Landscape Architecture students and Leila Tolderlund, Assistant Professor (CTT) and Associate Chair of Landscape Architecture in front of the winning 2017 Swiss Team house at the U.S. Department of Energy Solar Decathlon in Denver on October 16. They volunteered and helped disassemble and transport the green roof trays (350+) from the house destined for our CU Building fourth floor green roof, and helped set up the temporary installation.